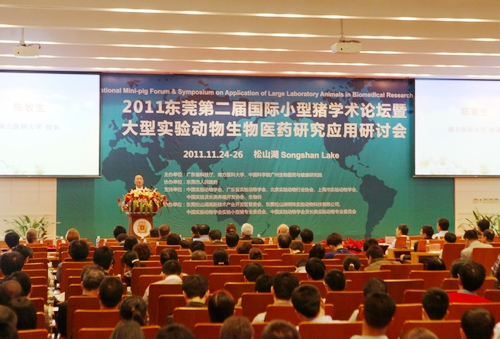 The 2011 International Minipig Academic Forum & Large-sized Laboratory Animal Biopharmaceutical Research and Application Seminar were held in Songshan Lake, Dongguan from November 25 to November 26. Zheng Yuguo, director of Biotech Development Center of the Ministry of Science and Technology, Qin Chuan, executive vice president & secretary general of Chinese Association for Laboratory Animal Sciences, Xuan Mingzhi, adviser to Guangdong Provincial Peoples Government and honorary vice chairman of UMC Group, Zhong Xiaping, deputy director of the Department of Science and Technology of Guangdong Province, Chen Minsheng, president of Southern Medical University, CAE academician Xia Xianzhu, Hu Wei, vice president of Southern Medical University, Song Tao, adviser to Dongguan Municipal Peoples Government, Liu Ning, secretary of Songshan Lake (Biopark) Party Working Committee and executive deputy director of Songshan Lake (Biopark) Administrative Committee, and Li Hang, deputy director of Songshan Lake (Biopark) Administrative Committee attended the opening ceremony. Joining the opening ceremony were also experts in laboratory animal sciences and biopharmaceuticals from the provinces and municipalities across China totaling 300 persons. President Chen Minsheng of Southern Medical University pointed out in his speech that minipigs, monkeys, dogs and other large-sized laboratory animals are indispensible and important supporting conditions for medical and life sciences, the development of which has a direct impact on the R&D progress and level of biopharmaceuticals. This seminar is of great significance to the summarization of research progress of large-sized animal applications, extraction and utilization of the features and comprehensive strengths of biopharmaceutical application in large-sized animal research and development, and forecasting of future R&D direction of large-sized animals. The Southern Medical University will give full play to its talent and technical strengths in biopharmaceuticals and laboratory animal science and technology, and work with Dongguan Municipal Peoples Government to build the large-sized laboratory animal biopharmaceutical research and development public service platformDongguan Southern Medical University Songshan Lake Laboratory Animal Science Park, and contribute to the development of biopharmaceutical industry in the Pearl River Delta and in China at large. Zheng Yuguo, director of Biotech Development Center of the Ministry of Science and Technology, revealed that China is rich in large-sized animals represented by minipigs and non-human primates, and has always attached great importance to the application and development of large-sized laboratory animals in biopharmaceuticals. The past two years have seen the Ministry of Science and Technology lauching several major state science and technology projects in relation to large-sized laboratory animals, including the iPS Cell Pig and Minipig Disease Model of Program 973 and Standardization of Animal Models and Laboratory Animal Sources for Critical Diseases and Establishment of Evaluation System of National Science and Technology Support Program. Against the increasing value in research and development and increasing application demand of large-sized laboratory animals, this second Large-sized Laboratory Animal Biopharmaceutical Research and Application Seminar was at a most opportune time and highly significant. Zhong Xiaping, deputy director of the Department of Science and Technology of Guangdong Province, stated that Guangdong has achieved remarkable results in the development and application of large-sized laboratory animal sources. The germplasm resources of Tibetan minipig, Wuzhishan minipig and Bama minipig have been established; the non-human primates have an annual output one third of the national output and are sold to the European and U.S. market; an AAALAC certified national beagle seminal resource base has been established. These achievements have allowed Guangdong to walk in the front nationally in terms of biopharmaceutical research, development and application of large-sized laboratory animals. Meanwhile, the Southern Medical University has partnered up with Songshan Lake High-tech Development Zone to build the large-sized laboratory animal (minipig, dog and monkey) biopharmaceutical research and development public service platformDongguan Southern Medical University Songshan Lake Laboratory Animal Science Park. The Park is not only a successful model of the Southern Medical Universitys social service and industry-university-research cooperation, but also an important promoter of industry transformation and upgrade, and development of biopharmaceutical industry of Dongguan. Qin Chuan, executive vice president & secretary general of Chinese Association for Laboratory Animal Sciences, stressed that laboratory minipigs, laboratory monkeys and laboratory dogs are increasingly applied to researches of life sciences and become increasingly important. Therefore, the Association has established the Laboratory Minipig Specialized Committee (based in the Southern Medical University) this year after the establishment of Laboratory Primate Specialized Committee. Through resource utilization and resource application of large-sized animals like laboratory minipigs, the goal is to rely on the expert team, give play to resource and technical strengths, unfold in-depth researches on medical and biological science, unveil the secrets of life and protect the health of mankind. Liu Ning, secretary of Songshan Lake (Biopark) Party Working Committee and executive deputy director of Songshan Lake (Biopark) Administrative Committee, pointed out in his speech that Dongguan is now at a critical stage of development model, environment and ability innovation to accelerate social and economic transformation. Therefore, Songshan Lake High-tech Zone is striving to build new growth poles for the Chinese biotech industry! As an important measure and supporting condition for the development of biopharmaceutical industry, large-sized laboratory animals are a key field of development in Songshan Lake. The Southern Medical University Songshan Lake Laboratory Animal Science Park built with the Southern Medical University is no other than an important measure to strengthen scientific and technological connotation development, build a whole biopharmaceutical research and development chain and industry chain. He earnestly solicited suggestions for the development of Songshan Lakes biopharmaceutical industry from the domestic and international laboratory animal and biopharmaceutical experts at the seminar. Li Hang, deputy director of Songshan Lake (Biopark) Administrative Committee, revealed that Songshan Lake has introduced 50 biotech enterprises, and such colleges and platforms as Guangdong Medical College, Southern Medical University Songshan Lake Laboratory Animal Science Park, Maritime Biotech Research Base of Sun Yat-sen University and Mathematical Engineering Academy of Chinese Medicine. Songshan Lake has superior laboratory animal supporting conditions and clinical trial environment, and powerful supporting policies. Further backed by the surrounding enormous market, Songshan Lake offers promising development prospects for biotech industry. He finally expressed his hope that more quality biotech enterprises could join Songshan Lake. Professor Gu Weiwang of the Southern Medical University, chairman of the seminar, was truly excited about the seminar. As chairman of Laboratory Minipig Specialized Committee of the Chinese Association for Laboratory Animal Sciences, he has been committed to resource development and biopharmaceutical research of large-sized laboratory animals. The laboratory Tibetan minipigs developed under his direction have been widely used in biopharmaceutical researches. He revealed that the large-sized laboratory animals represented by minipigs, non-human primates and dogs are an integral part of laboratory animals and an important supporting condition for the development of medical, pharmaceutical and biological sciences. In comparison to rodent laboratory animals represented by mice and rats, they have distinctive biological characteristics and unique application value. A high degree of similarity in anatomy, physiology, pathology and metabolism has made these large-sized laboratory animals insurmountably essential to biopharmaceutical researches. He further added that China boasts rich large-sized laboratory animal resources, and has made rapid progress in breading, standardization and biopharmaceutical research and application of large-sized laboratory animals in recent years. Human disease modeling and mechanism research based on such cutting-edge technologies as genetic modification, stem cell/iPS cell and genomics of large-sized animals particularly change with each passing day. To fully reflect the domestic and international biopharmaceutical researches and applications and development trends of large-sized laboratory animals, and meet the urgent demand of medical and biological sciences to large-sized laboratory animals, this seminar was convened to unfold in-depth discussions on biopharmaceutical researches and applications of large-sized laboratory animals. Its understood that attendees to the seminar amounted to 300 persons. About 40 domesticcally and internationally famous experts and scholars, including Dr. Xia Xianzhu, academician of CAE, Dr. Dan Hershko, director of Breast Health Institute of Rambam Medical Center, Israel, Lai Liangxue, chief scientist of Program 973, and presidents of Laboratory Animal Society of Beijing and Shanghai, made fascinating academic reports. This seminar was hosted by the Department of Science and Technology of Guangdong Province, the Southern Medical University and Guangzhou Biopharmaceutical and Health Research Institute of CAS, co-organized by Dongguan Municipal Peoples Government, and supported by the Chinese Association for Laboratory Animal Sciences, Guangdong Association for Laboratory Animal Sciences, Beijing Association for Laboratory Animal Sciences, Shanghai Association for Laboratory Animal Sciences, and Chinese Association for Breeding and Development of Laboratory Primates, and undertaken by Songshan Lake High-tech Zone Administrative Committee, Songshan Lake Pearl Laboratory Animal Technology Co., Ltd. and Laboratory Minipig Specialized Committee of the Chinese Association for Laboratory Animal Sciences. As one of the undertakers of the seminar, Songshan Lake Pearl Laboratory Animal Technology Co., Ltd. is the operator of Southern Medical University Songshan Lake Laboratory Animal Public Service Platform. Its also Chinas first comprehensive laboratory platform for such large-sized laboratory animals as monkeys, dogs and minipigs. After the success of the 1st International Minipig Academic Forum in 2010, the 2nd International Minipig Academic Forum & Large-sized Laboratory Animal Biopharmaceutical Research and Application Seminar was now held in response to the booming development of domestic and international large-sized laboratory animal segment. The event was to gather domestic and international professional talents to probe into the research status and trends of large-sized laboratory animals and put forward suggestions for better utilization of large-sized laboratory animals to biopharmaceutical researches.